Good morning, friends! Happy Monday! 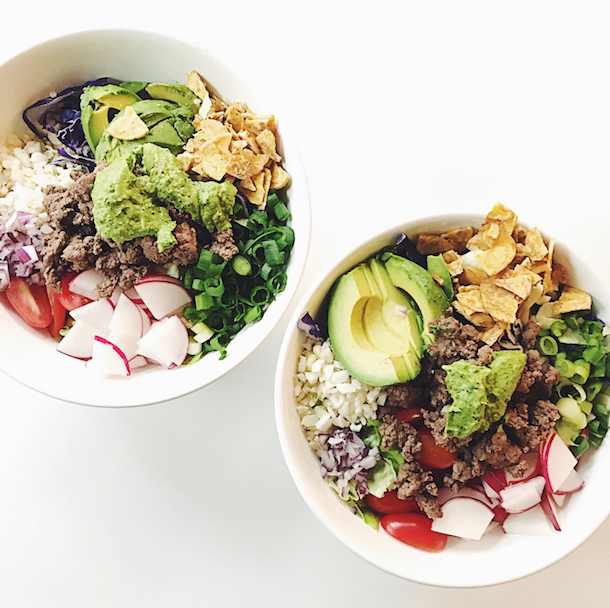 If you came here expecting a Whole 30 update, I’M SO SORRY. It will be up tomorrow, I promise! Everything is going well and I’m still on track, but I had to shift things around to tell you about something exciting today! p.s. If you are new here, WELCOME! I hope that you’ll take a minute and poke around. So, I’m sharing this steal of a dress (that I teased with last week on Insta) and I’m excited to show you how versatile it is! It was a bit of an impulse buy because #1 it was flowy enough for the bump and #2 was under $50, but once I got my hands on it I knew that it would be a piece that I would end up wearing a ton. There are 4 great colors available, but I fell in love with this blush shade. 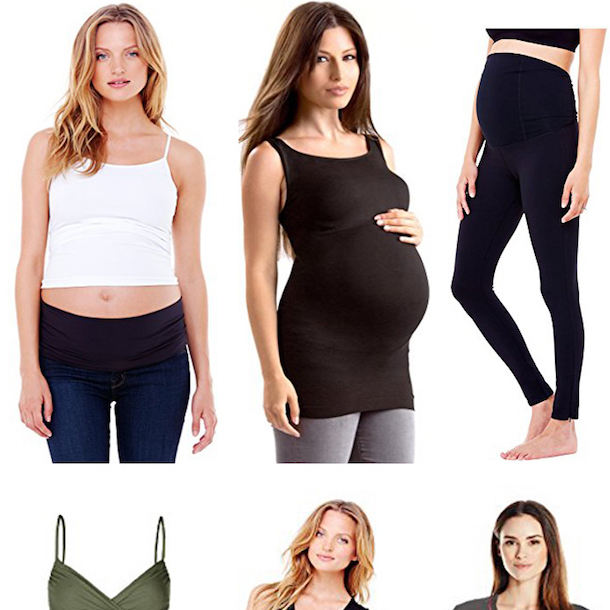 It’s been fun to dress it up or down and is perfect for a growing baby bump, but is just as flattering without one. 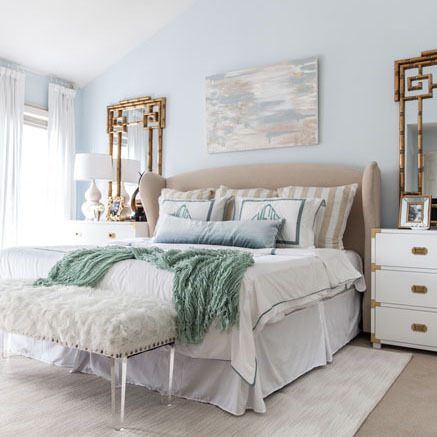 See how I styled it both ways below and keep reading to hear about an exciting new series that we are starting for YOU! If you guys haven’t snagged this moto jacket yet….what on earth are you waiting for??? It’s on sale for $58 and is the highest quality faux leather with amazing details for this price. I get more compliments on this guy than nearly any other piece in my Fall lineup. Here’s a view of it without the jacket so that you can see the sleeves. They have a blouson detail with a banded wrist, which I love. 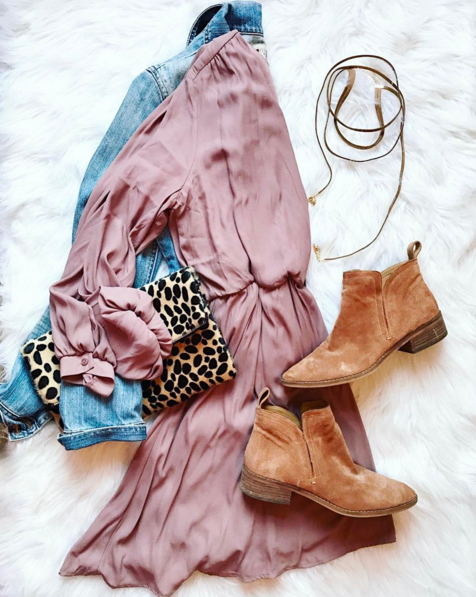 You can show off the sleeves by wearing it with a sleeveless vest or as the weather warms just throw on the dress with some cute gladiator sandals. Fit Info: I’m 5’9 and am wearing a Medium. I’m also 25 weeks pregnant here, so the length works even when covering a bump. The crossover top is a tad low, but I’m not wearing a cami or bandeau here. I might wear one, depending on what the occasion was. A lacy bralette would be super cute underneath as well. I also dressed it down by throwing a washed denim jacket on top and paired it with some flat booties. Great for a day of shopping or a casual dinner. Now for an exciting project! I’m teaming up with two of my blogger friends and we are putting together a weekly series that I know you guys will love! 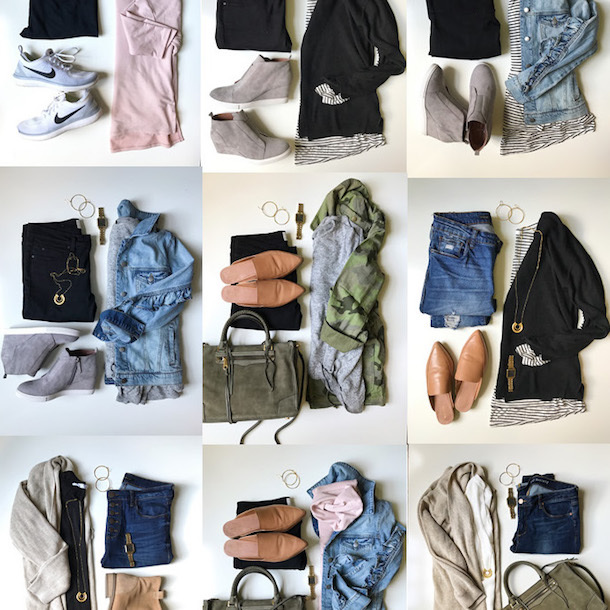 On the first Monday of each month we are going to be sharing a “Mom Style Monday” post that’s loosely curated around a certain”theme” that we think is relevant. 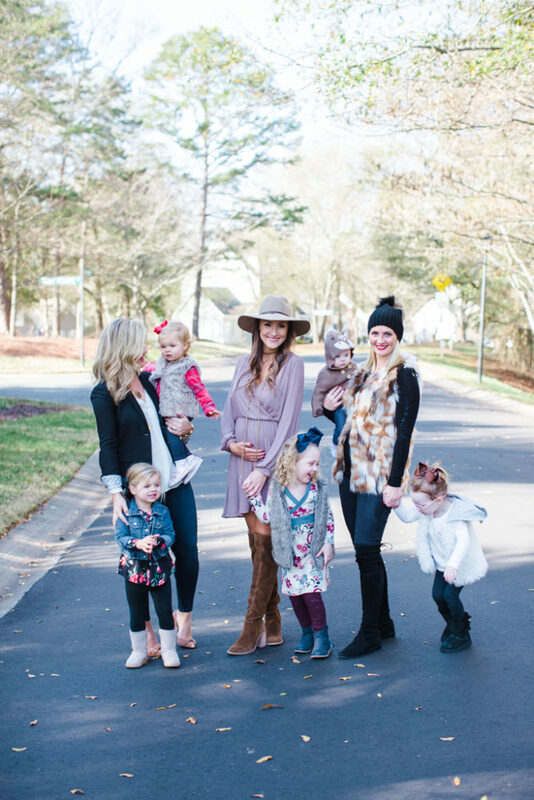 Between us moms, we have 5 (+1/2) little girls under the age of 4 so, believe me, we get it that chic mom style doesn’t come easy. We want this series to be inspirational, motivational and become a destination for when you feel your mom style game is a little uninspired. Our first official post will be Monday 2/6 (all about loungewear + hosting a casual playdate brunch), but we wanted to give you guys a heads up a few weeks ahead of time! 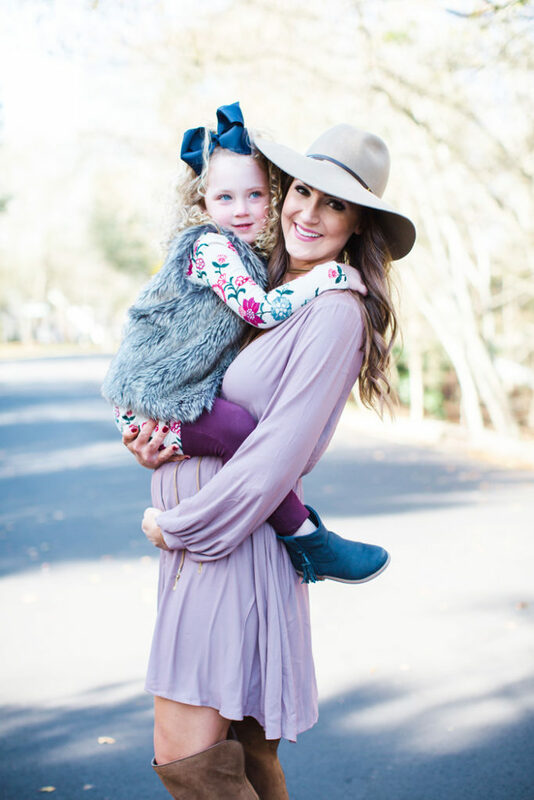 If you are a blogger, we are also opening up these posts as a link up, so get your best loungewear post ready and please join us on 2/6…the more mamas…the merrier! Can you guys get over all of these babies?? 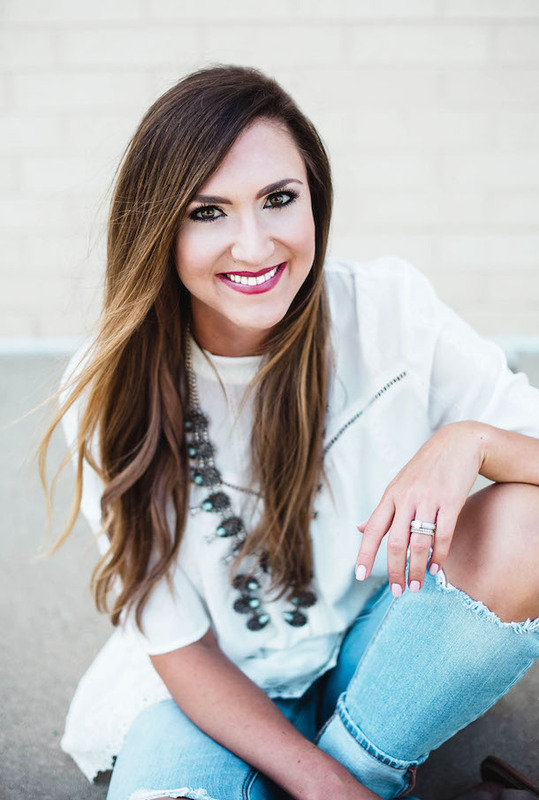 The other hosts will be Cristin of The Southern Style Guide and Kate of Dress Your Guests. As we finalize the first 6 months worth of posts, we would love to hear from YOU! Any specific #momstyle topics you’d like to see covered?? We can’t wait to see you back here in 2/6 for our first post! 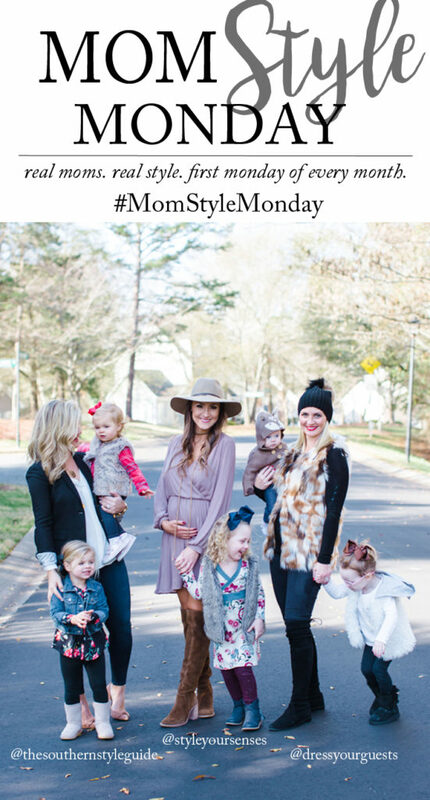 So excited for the Mom Style Monday posts. I can put on jeans and a T-shirt/sweater to run around all day with the kids. What I struggle with is date night. After a long day, I don’t have time to try on a hundred different outfits plus make sure dinner is ready for the sitter. I also want to look sassy for the hubby in something other than jeans.